Several major US airlines are experiencing significant delays Monday morning after a computer glitch caused flight disruptions nationwide. Southwest, Delta, United, JetBlue and Alaska Airlines were forced to ground or delay flights due to a problem with a program called AeroData, which is used to calculate the weight and balance of flights before takeoff, according to the Federal Aviation Administration. 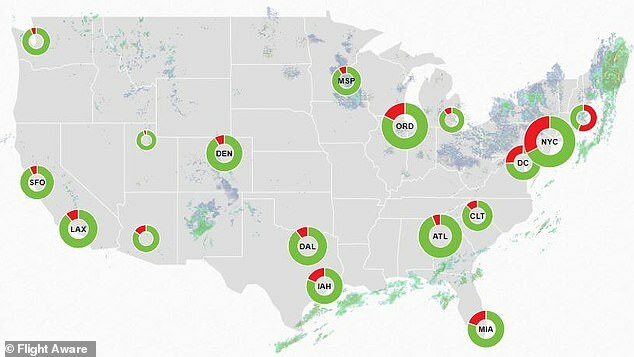 More than 852 flights have been delayed and 36 have been cancelled nationwide as of 9.10am Eastern, including one third of flights at airports in New York City, Boston, Chicago, Detroit and Washington, DC, according FlightAware’s MiseryMap. A significant portion of flights in Dallas, Charlotte, Atlanta and Miami were also delayed. It’s unclear how many of the delays were caused by the AeroData issue. affecting major US airlinesComputer outagedisruptions nationwide. I Have Figuered Out What Is Happening To All The Jet Planes, 5G Is Screwing With Their Avionics ! ou heard it here first . It will now be all over the Media within days ! 5G Testing is knocking them out of the skies , it is too strong ! This is the precise reason you are not allowed to use a mobile phone on a plane !